Clean Force or Clean Farce? Well, I got my just rewards for buying a rock-bottom Home Depot cheap pressure washer. The total accounting: it lasted 3 years and 1 month. For a product that was priced in the $100 range, I knew I was living on borrowed time. But I was never sure what would be Clean Force 1400's fatal flaw. As it turns out, the threaded coupling that accepts the water supply hose eventually wore down, shredding the threads. That's because the coupling is made of plastic! By spending a bit extra for a brass coupling, Clean Force could have eliminated that weak point. During those 3 years, though, it did a good job. No complaints there. It even helped me wash the tile in my shower. Make no mistake about it: the Clean Force 1400 Pressure Washer is bare bones, entry-level stuff. 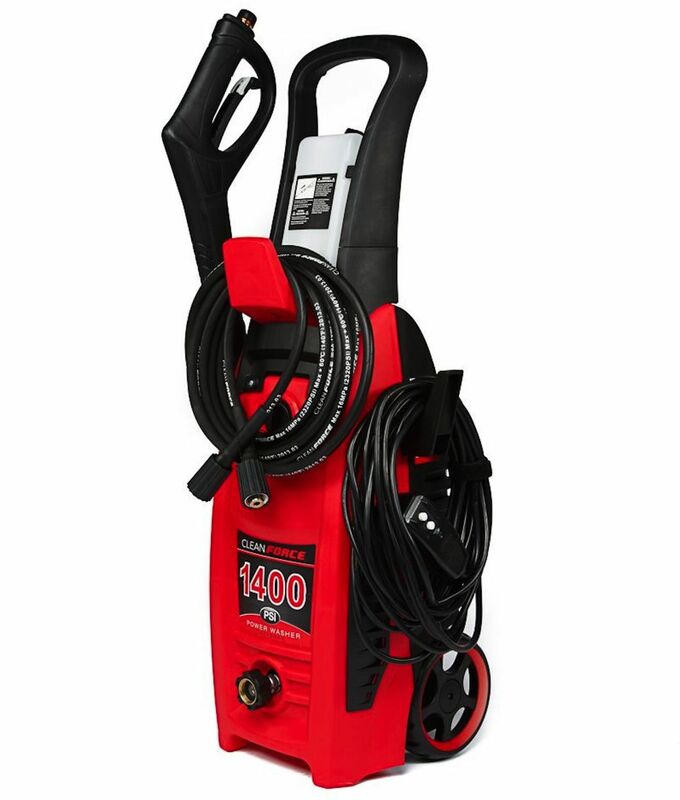 With a psi of 1,400, this pressure washer is about the lowest power washer on the market. But at least the price is commensurate with the power level, and the machine does have a few good points. If you're looking for high-pressure, forget the electric models. They simply cannot match the gas-powered models. Electric pressure washers are for people who don't want the inconvenience of dealing with gasoline powered engines. No hauling gas back from the service station: just plug it in and you're ready to go. But the cords! When using a pressure washer, you've already got two lines connecting to the machine: the fresh water supply and the washer hose. Adding the electrical cord means hauling around three heavy lines. This tends to inhibit movement. It's an acceptable trade-off if you know what you're getting into. I bought it for one use only: to clean the siding of my house before painting. This unit delivers 1.4 gallons of water per minute under 1,400 psi (pounds per square inch). The power cord is 35 feet long and the washer hose is 19 feet. An onboard detergent tank automatically mixes the detergent with the water. You turn the detergent flow on or off by sliding the end of the sprayer wand in or out. The sprayer wand adjusts from a fine needlepoint to a wide spray. Well, it works. At its most concentrated flow, this pressure washer will blow off the worst gunk from your pavement--embedded dirt, moss, mud, etc. It's powerful enough to chew up soft wood and even strip paint. But it's slow. With a more powerful machine, you would be able to knock out 20 feet of concrete entry cleaning in five or ten minutes. But with this lower-power pressure washer, expect to spend an hour on the same task. That's because only the most concentrated stream with blast away embedded dirt, and this stream covers only about four square inches. It's a painfully slow process. What I really hated about the Clean Force Pressure Washer was how it never stayed upright. It's a vertical machine with two wheels at the bottom--it looks almost like a house vacuum. And like a vacuum, it always tips over. Even though the cords attach at the bottom of the machine (theoretically minimizing the chance of pulling the machine down), the machine still tips because of the vibrations caused by blasting the washer on and off. Eventually, I left the washer on its side when using only fresh water. This presented a problem when I wanted to use the detergent/water mixture. The detergent tank needs to be upright because it draws detergent with a siphon tube. So, I had to brace the machine against the house to ensure that it would not tip over. I do like the Clean Force's tiny size, which takes up no more than a couple of square feet of floor space. Also, the nozzle, wand, hose, and electric cord store fairly neatly on the machine. Buy if you need to: lightly spray off walkways; clean siding on a one-story house; or blast off gunk in small areas. For uses above and beyond this, the Clean Force 1400 might make you crazy; go for a higher-power electric or gas model.